The Midtown Music Shop, which opened in November, is the newest addition to music-oriented shops in the Cooper-Young Area, offering instruments that are a little different - everything from ukuleles to mandolins to banjos. Located at 2272 Central Ave., Midtown Music was started by Jeremy Barzizza, who has been repairing instruments, namely saxophones, for years. He is a musician as well, and wanted to do more with his passion. Though this is not the first shop of its kind in the area, he said that the shop has a number of things that makes it unusual from other shops. 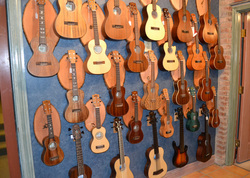 For one, the types of instruments that the shop has vary. Among more common instruments such as acoustic guitars and trumpets, there are more uncommon ones such as mandolins, banjos and ukuleles that adorn the walls of the building. Barzizza particularly talks about the importance of the ukulele, and why it is a great first instrument. On the Midtown Music Shop’s website, there is a list of instruments that they hold, along with instruments that will be arriving soon. The place also offers lessons for a variety of instruments, taught by a number of teachers, and also voice lessons, which first-time customer Daniel Stovall was interested in. Another thing that Midtown Music offers is a music studio, located at the back of the store. The notion of anyone coming to the Midtown Music Shop, whether musical or not musical, is encouraged, and this shop can be friendly towards amateurs. On the shop’s Facebook page there is information about new happenings with the shop, and among these is what Barzizza calls the “Ukulele Circle”, which began only in February, and occurs on Tuesdays and Thursdays. It has a growing interest among both kids and adults, going there to be among other players who are learning just as much as they are. In the end, the Midtown Music Shop is very young, but Barzizza feels optimistic about it.